I love making herbal vinegars to add zip and zing to homemade cooking. Fruit infused vinegar can add a touch of flavor for salad dressings, as well as play a part in healthy skin care. They are so easy to make and are great for adding an extra boost of flavor. Are you ready to make your own herbal vinegar? Part of the fun of homemade cooking and baking is playing with the tastes and textures of food. Once you have the basics down, nearly anything is up for a taste overhaul. What vinegars should you try? Apple cider vinegar will give you that tangy sensation it’s famous for. It is also great for hair rinses. White vinegar will make the flavor of the herbs really shine through. Champagne vinegar will give you a delicate vinegar that is great addition to fermented vegetables or salad dressings. 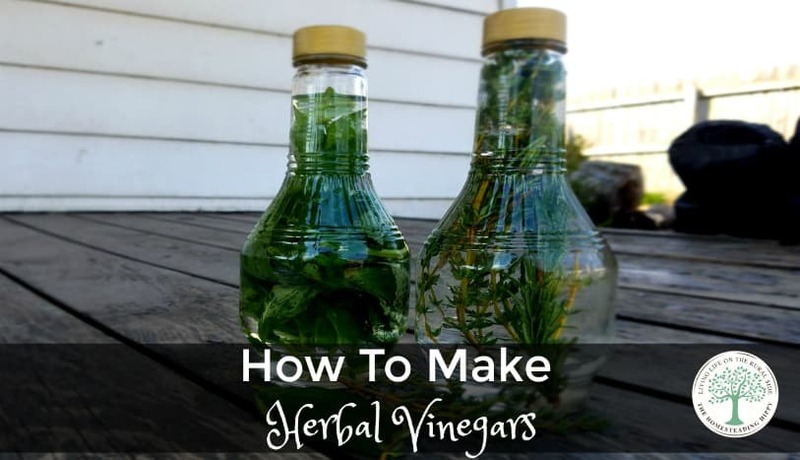 Herbal vinegars have a basic recipe- 2 cups vinegar to 1 cup of fresh herbs. You want to make sure the herbs are as fresh as possible for the best result. Simply bruise the herbs a bit to release their oils, and place them in the jar. Cover with the vinegar, and seal the cap tightly. Gently shake every day for about a week. Then, your herbal vinegar is ready to use. Store in a cool, dark place. To make herbal vinegars, you can use any jar you have on hand, as long as you keep it out of direct sunlight. Direct light can cause them to break down, and lose their flavor faster. In general, infused vinegar has a shelf life of 2-4 months. For another fun herbal vinegar recipe, try fruit infused vinegar! You can add fruit infused vinegar to salad dressings, marinade, or even as part of your skin care routine. Fruit flavored vinegar recipe has a general ratio of 1 cup fresh fruit to 1 cups of vinegar. NO added sugar is necessary for this. mix 2 Tablespoons herbal vinegar and 1 Tablespoon honey with 8 ounces warm water as a healthy drink in the mornings and after workouts. Splash 2 Tablespoons of fruit infused vinegar on your face for a refreshing toner. Or, Simply apply with a cotton ball soaked in the vinegar for a refreshing zing at the end of a long day. What ways would you use herbal vinegars? Be sure to pin this for later.